January is in full throttle and Christmas has been tucked neatly away. For a time. Blink twice and it will be back. 🙂 Don’t you worry. But for now, we are met with the rest of winter and good old January. Usually, I get a little glum during January with it’s gray skies, polluted inversion and tight budget. This year, however. I’m feelin’ good. Feeling grand, in fact. The weather here has been a beautiful clear skied 50 degrees for the past week. Unprecedented, for January in Utah. Just seeing the clear blue sky, my little twin boys riding bikes and feeling a crisp breeze blow through my open window is enough to put a smile on this face of mine. Life feels good. And this broccoli tastes good! I’m not going to lie to you. It’s no Peanut Butter Fudge. But it has occurred to me in recent days, that a body just feels a lot better when it eats things like broccoli and other tasty vegetables multiple times a day. It turns out Peanut Butter Fudge doesn’t have much nutritional value. I guess that means a person shouldn’t eat it for breakfast, hu? Something for me to keep in mind. Just in case I ever meet anyone who likes to eat peanut butter fudge for breakfast. I’ll be sure to let them know. Roasting broccoli in the oven, (as opposed to boiling it, or steaming it the microwave) gives it a unique flavor. It retains a bit of crunch and has a nutty taste to it. Add a delicious glaze and you have a fine side dish indeed. Yum. Healthy and yum. It goes fabulously well Brown Rice and the Bourbon Chicken I posted earlier this week. Also, if you are wondering how to cook Brown Rice (and why wouldn’t you be?) I posted a simple recipe for it a couple of years ago. You can find it here. 1. Wash your broccoli and cut off the big stems. Spray a large cookie sheet with cookie spray and place the broccoli on it. Spray the top of the broccoli with cooking spray. 2. Put the cookie sheet in your oven at 425 for about 10 minutes, or until a fork can be inserted easily into the pretty little vegetable. 3. While your broccoli roasts away place 1 1/2 T soy sauce, 1 T olive oil, 1 T balsamic vinegar, 2 T honey and 1 t peanut butter into a small sauce pan. Heat the sauce over medium high heat. When it boils, remove it from the heat. 4. 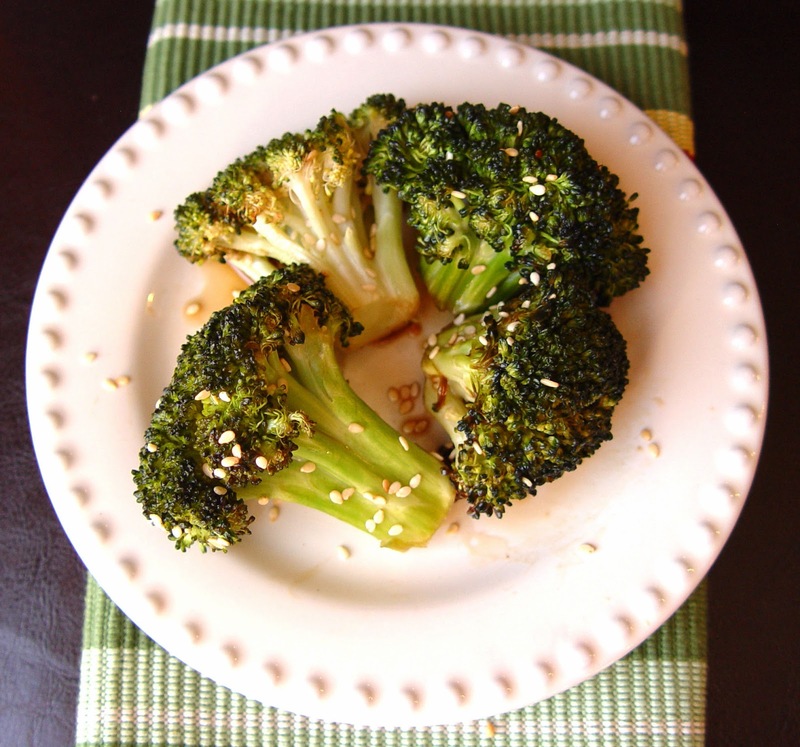 When the broccoli is done, put it in a medium sized mixing bowl and pour the sauce over the top. Stir it all around, making sure each broccoli piece has sauce on it. 5. 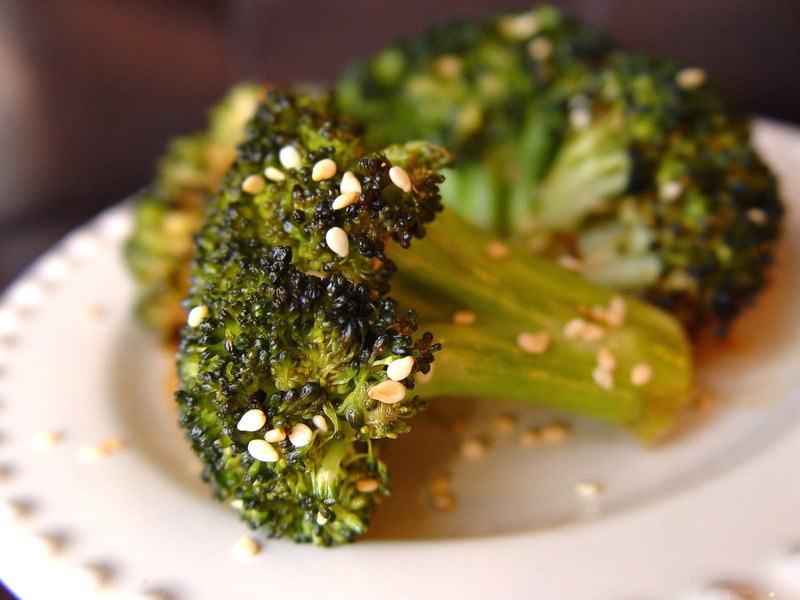 Sprinkle 1 T toasted sesame seeds over the broccoli and serve. I am in shock and awe to find out that peanut butter fudge is not a good choice for breakfast. I thought i disliked peanut butter and had never eaten it (I KNOW!!??) but tried my peanut butter fudge this year and can I just say….oh my! I enjoy your blog & love following along with you, Your bourbon chicken is on my menu for tomorrow, this broccoli sounds wonderful too. have a beautiful weekend, no matter if the skies are grey or blue!! Ok, if you eat peanut butter fudge for breakfast, then eating broccoli for lunch must cancel it out, right? I can't wait to try this broccoli for lunch today. We also have the same beautiful weather up here in Calgary, Alberta. Enjoy it while it lasts! This was delicious! The peanut butter gave it that wonderful nutty flavor that we just couldn't get enough of. Thanks so much for this recipe! Do you think regular sesame seeds would do just as good of a job? We loved this! Just made it tonight for dinner. Thanks so much, I love your blog! I just made this tonight and WOW!! I did a touch less of olive oil and added a touch of sesame oil. Also, I added a cup of cooked chicken and made a meal of it!! Has anyone used frozen broccoli in this recipe?